The ignition gun is suitable for cars, motorcycles and all two-stroke or four-stroke petrol engines. Ignition timing lights can be very intuitive to detect the engine flywheel or pulley on the ignition timing to make the appropriate adjustments. Can detect the car knock suppression control system, vacuum advance angle control system, with the change in speed to change the advance angle in the engine under normal wear and tear, timing belt and pulley on a regular basis, the cylinder pressure drop, Ignition timing adjustment. Note: The power supply 12V red positive black negative power off the wrong, high-voltage line sensor clip, caught in a cylinder of high-voltage line, the sensor clip on the arrow pointing to the direction of the spark plug in order to normal use. Input voltage: 12V. Speed: up to 8000rpm.. Working temperature: 0-40??. 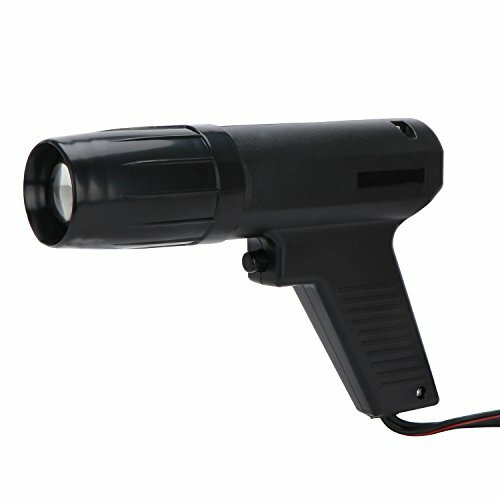 The ignition gun is suitable for cars, motorcycles and all two-stroke or four-stroke petrol engines. Detachable clamp-on inductive pick-up for easy and safe hookup. If you have any questions about this product by BRAUTO, contact us by completing and submitting the form below. If you are looking for a specif part number, please include it with your message.